"Life's too short to dream small"
That quote is from a twitter exchange that I had last week with today's Offroad Blogging guest - Jennifer Flores. And she IS the epitome of dreaming the big dreams. We'd be pretty happy having a successful design blog, right? With lots of followers and sponsors and press? Jennifer has created that with Rambling Renovators. But she wasn't content with just that. Like any go-getter, she saw an opportunity and went after it - she's the co-founder of Canada's design and lifestyle blogging conference BlogPodium. Think of it as the Canadian Alt Design Summit. BlogPodium is a conference for design and lifestyle bloggers. It has taken many forms since its inception in 2011...from informal meet-ups, to a panel discussion at the Interior Design Show to a half-day seminar. This September 21st, we will host our largest conference yet featuring Sarah Richardson as one of our Keynote Speakers, a full day of microsessions, a cocktail reception, and a grand exhibit space where bloggers can meet one-on-one with fabulous brands who want to work with bloggers. Inspired by some of the great conferences in the US like Alt Summit and SNAP Conference, I wanted to create something like that in Canada. Its a chance for bloggers (new, experienced, and the blog curious) to come together, to learn from their peers, and to make connections with industry. Hey, I know that keynote speaker from last year - Nicole Balch of Making It Lovely! Real life is where the real inspiration happens. You can connect with others online, tweet each other, send emails...but there's a magic that happens when you talk to someone in person, when you hear the sound of their laughter or see the excitement in their eyes when they speak about something they're passionate about. "When you find yourself in a room full of people who share your same interests, it's electrifying"
It gives you energy and inspiration to create your best content online. What was your biggest worry before launching BlogPodium? My biggest worry was that BlogPodium wouldn't deliver what people want. BlogPodium caters to a diverse range of bloggers. It's difficult to put together a line up of speakers and sponsors that everyone will find appealing. We've grown with each event and while BlogPodium is a "big" event, I hope it speaks to you as an individual and that you find an idea, inspiration, knowledge... something that will help you make your blog better and more satisfying. I think I'm most proud of building a strong team. I'm pretty good at recognizing my limitations and knowing what is beyond my skills. Bloggers are such creative, talented folks...if you surround yourself with talented people and give them the room to do what they do best, you all end up in a better position. "You need to know what you should control and what you should entrust to others to manage"
I think of BlogPodium as a room full of friends you haven't met yet. 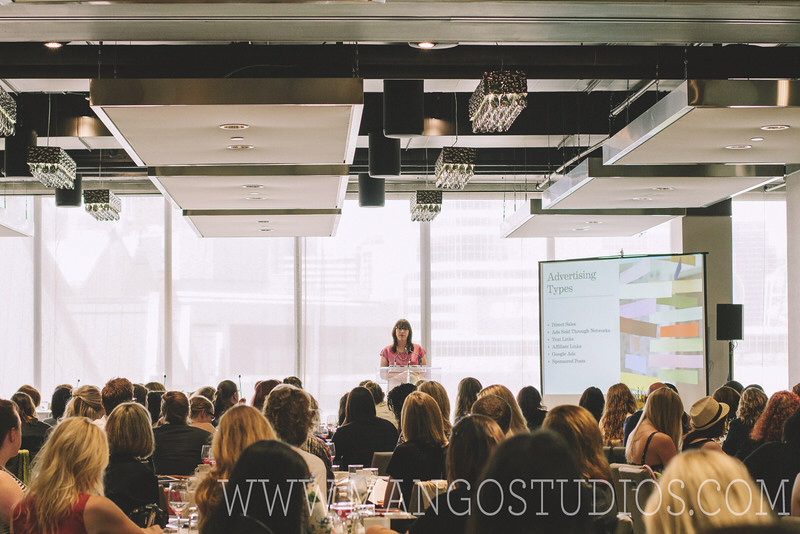 Bloggers should attend to learn practical things like Photoshop tips or how to get noticed by PR agencies, to get exposure to great brands like The Home Depot Canada, Indigo, Para Paints and more, and to have an awesome time. "It's a chance to come together as a community and spend time with people who really 'get' you." I know it's successful when I read recaps of the event like these. But real success happens in the weeks and months following our event. When I read about bloggers collaborating or bloggers and brands working together, I like to wonder if we played a small part in bringing those forces together. Depending on the scope, it takes about 6-8 months to plan each conference. The majority of that time is spent wooing sponsors. Unfortunately, design and lifestyle blogging in Canada isn't as evolved as other genres (like mommy blogging or fashion blogging). It still takes quite a bit of effort to convince design brands of the value in connecting and working with bloggers. What is the most challenging part about putting on BlogPodium? The most challenging part is...everything! It's a big event to organize but I truly love every minute of it. It's also a challenge to get the word out. We're still a young conference and we bloggers tend to look to the big US conferences for knowledge - but there is so much you can learn right here from a Canadian perspective! What great advice - know your limitations. Do what you do best AND find others to collaborate with to fill in where you maybe aren't the strongest or the most skilled. And have you noticed that a common thread throughout all of these Offroad Blogging interviews is community? Like Jennifer says, "getting together with people who really 'get' you". Finding those likeminded people who are passionate about what you love. People who inspire you to go after your dreams, as you inspire them to do the same. That's one of the biggest pluses for me about blogging, hosting offline events, AND going to conferences. I've made some amazing friends that I otherwise would never had met. Geography doesn't matter anymore - we aren't limited by where we live for our community. I'm going to BlogPodium this September. Gabriel, the Artful Desperado and Giulia of Audrey's 74 are also going - they both are speaking too! It'll be an Alt Summit reunion in Toronto. Giulia's topic: "You CAN have both – balancing a day job & a successful blog". And Gabriel's topic: "How to use your blog to land your dream job". Practical and based on their own experiences. They both are so talented and so focused on making things happen.